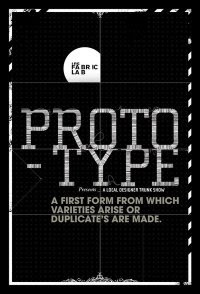 This week The Fabric Lab (www.fabriclab.com) presents a fashion designer trunk show called "Prototype". A small studio it is, but the union of the neighboring cupcake shoppe The Shoppe (www.theshoppedenver.com) , as well as the media sponsor FM Magazine (www.fm-mag.com), will make it another hip-to-be-seen art party with live music, cupcakes, and of course, PBR. I don't have much info on the designers but the scene is always super fun. Actually, the last time I was on east Colfax for an art party the boys in blue had helicopters overhead. It must have been The Denver Roller Girls fashion show on the storefront sidewalks that they couldn't get enough of - way extreme, but a good story none the less. See you there! !